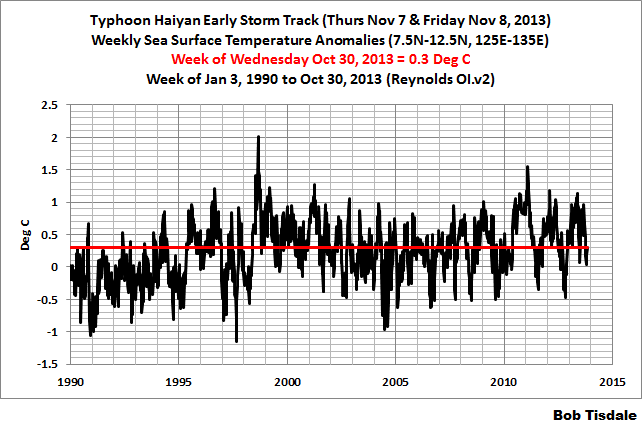 And for those wanting a longer-term look, based on the preliminary October 2013 values, there wasn’t anything unusually warm about the sea surface temperature anomalies for the early portion of Typhoon Haiyan’s storm track. This entry was posted in SST Update, Typhoons. Bookmark the permalink. Pingback: Super Typhoon Haiyan, ‘…as intense as a tropical cyclone can get. ‘ | Watts Up With That? Bob: Is there some reason you chose 1980 and 1990 as the starting dates for your graphs? The IPCC claims anthropogenic warming became dominant in the second half of the century. In land surface records, warming took off sometime in the 70’s. Either of these dates would make more sense to me. 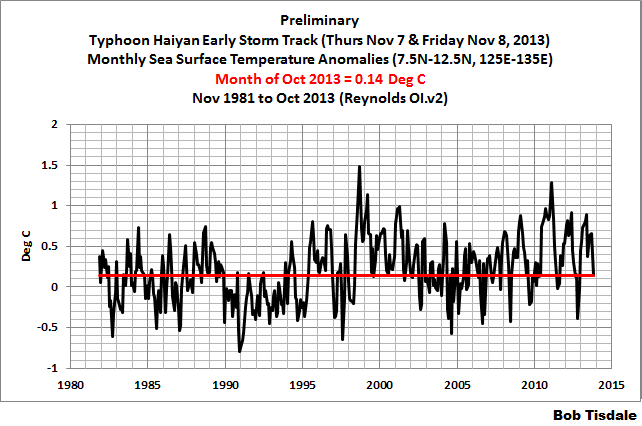 In a recent speech, Al Gore claimed that SSTs were much warmer along Sandy’s track due to global warming? Do you know where this claim comes from? I’m not sure why there should be all this fuss about a few tenths of a degree in SST when hurricanes are supposedly heat engines powered by the temperature difference between the surface the top of the convective towers. Rising SSTs will create more area above the 26.5 degC threshold where hurricanes might develop, but after that I’m not sure SST makes much difference. The weekly Reynolds OI.v2 sea surface temperature data is broken into two subsets–before and after 1990–thus the start year of 1990. The monthly Reynolds OI.v2 sea surface temperature data starts in November 1981. SST is transient, the real action is in the water column, which has definitely been warming in recent decades, so you analysis is moot. Bruce, I only presented one plot of sea surface temperature. My analysis is not moot, because it addresses the nonsensical claims by alarmists. Sorry for the cross-out, Bruce. I thought you were commenting on the “Games People Play” thread. Additionally, the typhoon has to be fed from the ocean. Pingback: Reality is Absent from Michael Mann’s Activist Article on Typhoon Haiyan | Watts Up With That?